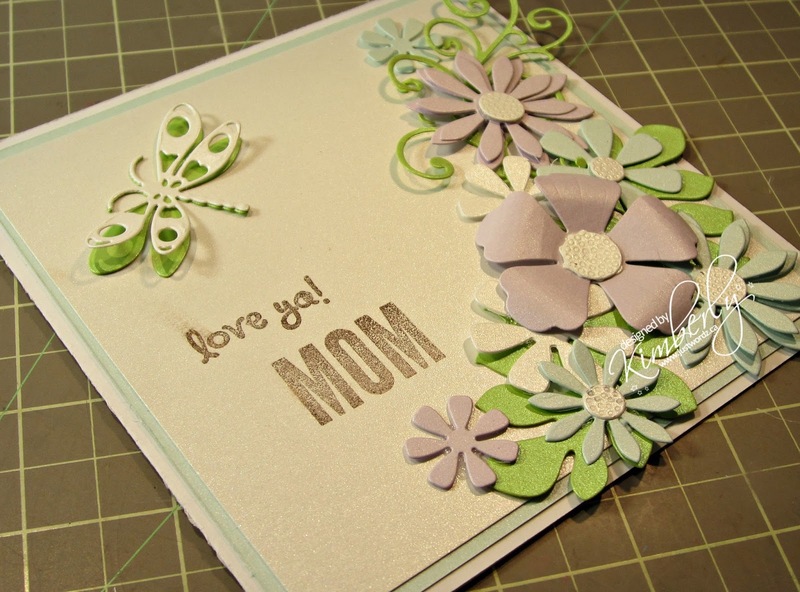 JustWordz: Mother's Day and CHALLENGE!! Hey everyone, thanks for dropping in! As you all know i lost my MOM in January but i think of her everyday! favorite thing was flowers, i made this card to showcase that. Let's have a look and read the bottom of the post for all the details. Ok as you can see i went to work on my cuttlebug to cut these dies out. with die cuts. No tearing and they popped right out of my dies.. It's really hard to tell with the light colours i used but this paper just shimmies..
i was able to fix it. I'm just so impatient and can't wait for it to dry...humph. If you would like to join in on the fun..here is the link to get your submissions in. I'm so sorry for the late notice but you have till the eighth to get them in.. Such a pretty card Kimberly!